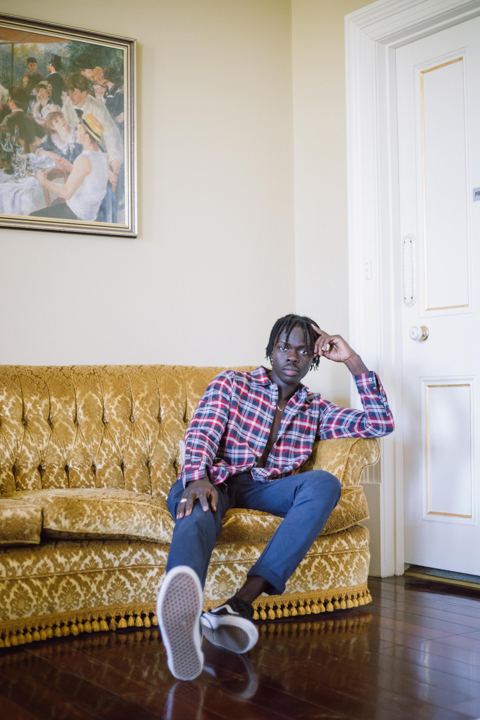 Jorgia Dunn and Adrian Dorsey have launched Nowa, a local streetwear label with transparency and community at its core. Adelaide duo, Jorgia Dunn, a former campaign coordinator of Nick Xenophon, and Adrian Dorsey who previously ran Adelaide streetwear boutique, Zero, have transformed a basement in the heart of Rundle Mall into high-end clothes shop, Nowa (pronounced Noah). The shop’s James Place façade was given over to Sydney-based artist James Kearns, creating a work designed to draw shoppers into the underground space. “The art space will interchange…We’re working with James [Smith] for SALA. We’re producing denim jackets that he’ll be painting. Making one-off jackets. [But] whoever the artist is, we’re trying to make this an extension of their business,” says Jorgia. The artwork and the underground locale were also intended to set the tone for Nowa. As a fashion label, a large part of Nowa’s business model is its commitment to sustainability and transparency. In a bid to minimise waste, there is not a swing tag to be seen throughout the store. And Jorgia says that in addition to using biodegradable bags for all of their online orders, Nowa is committed to creating clothes free from polyester and plastics. “What we wanted to produce was eco-friendly, sustainable and good quality,” says Adrian. The Adelaide brand is part of a growing number of clothing labels striving for increased transparency in the fashion industry. Adrian says Nowa takes great pride in being able to share every step of their production line with their customers. “We know who is making our pieces. We have 40 full-time staff…we’re constantly chatting on Viber,” says Jorgia. Drawing inspiration from brands across Europe and Japan, the pair have been working hard to offer lasting pieces that can be worn season after season. “For me, it’s about having the staples done really well, and keeping the colour palette really modest, I guess. Not following the trend colours that you’re not going to want to wear in a month,” says Jorgia. “We’ve done two different skirts, in the same style, but different leather. So, if the uni student can’t afford the thicker one, but she loves the fit, she can still have that look. The businesswoman, who can put that money down, then she will,” says Jorgia. The Nowa store is also home to a curated collection of complementing brands. These include Saturday the Label, Carrots by Anwar Carrots, Jungles, Chinatown Market, Belief and Raised by Wolves. As well as offering a diverse range of cuts and styles that can be worn as streetwear or office attire, Adrian says Nowa intentionally stocks a broad range of sizes, prices and unisex items. And if all goes according to plan, Nowa will also offer locally produced beer and wine.